Site code ACN given by Corpus of Maya Hieroglyphic Inscriptions (1975:23-24; 1982:185-187; 1999:187-189; 2012; 2016); cited by Riese (2004), Mathews (2005). Location recorded at Structure 1 by Karl Herbert Mayer with a handheld Global Positioning System (GPS) in 2006 (unpublished field report). Ball, Joseph, and Jennifer T. Taschek 2013 Acanmul, Becán, and the Xcocom Phenomenon through a Type-Variety Looking Glass: Resolving Historical Enigmas through Hands-On Typological Assessments. In: Ancient Maya Pottery: Classification, Analysis, and Interpretation. Vol. , edited by: Aimers, James J., pp. 142-162. Maya StudiesUniversity Press of Florida, Gainesville, FL. Corpus of Maya Hieroglyphic Inscriptions (CMHI) 1975 Corpus of Maya Hieroglyphic Inscriptions. Volume 1: Introduction (by Ian Graham). Cambridge, Massachusetts: Peabody Museum of Archaeology and Ethnology, Harvard University. 1982 Corpus of Maya Hieroglyphic Inscriptions. Volume 3, Part 3: Yaxchilan (by Ian Graham). Cambridge, Massachusetts: Peabody Museum of Archaeology and Ethnology, Harvard University. 1999 Corpus of Maya Hieroglyphic Inscriptions. Volume 6, Part 3: Tonina (by Ian Graham and Peter Mathews). Cambridge, Massachusetts: Peabody Museum of Archaeology and Ethnology, Harvard University. 2012 Site Codes (updated July 2012). http://peabody.harvard.edu/files/cmhi/CMHI_SiteCodes_FINAL_2012_forWeb.pdf (by Barbara Fash). (accessed July 23, 2015) 2016 Site Codes (updated Februar 2016). https://www.peabody.harvard.edu/files/cmhi/CMHI_SiteCodes_FINAL_2016.pdf (by Barbara Fash). (accessed December 18, 2016) Mathews, Peter 2005 Site Names and Codes. Foundation http://research.famsi.org/whos_who/sitenames_codes.htm (accessed July 23, 2015) Ojeda Mas, Héber, and Adriana Sanchez 2001 Las primeras intervenciones en el sitio arqueologico de Acanmul. Los Investigadores de la Cultura Maya 9: 255–266. Pollock, Harry E. D. 1980 The Puuc: An Architectural Survey of the Hill Country of Yucatan and Northern Campeche, Mexico. Memoirs of the Peabody Museum of Archaeology and Ethnology, Harvard University 19. Peabody Museum, Cambridge, MA. Riese, Berthold 1980 Sechster Arbeitsbericht über die Hamburger Maya-Inschriften Dokumentation: Die Texte der Hamburger Maya-Inschriften Dokumentation nach dem Stand von September 1976. n.p., Hamburg. 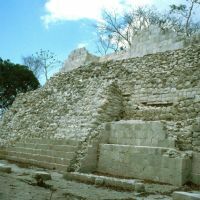 2004 Abkürzungen für Maya-Ruinenorte mit Inschriften. Wayeb Notes 8. http://www.wayeb.org/notes/wayeb_notes0008.pdf (accessed July 23, 2015) Staines C., Leticia 2002 Una pintura del dios K’awil en Acanmul, Campeche. Boletín Informativa La Pintura Mural Prehispánica en México 8(16): 35–38. Williams-Beck, Lorraine A. 1999 Historia de tres ciudades: Ah Kin Pech, Acanmul y San Francisco de Campeche. Estudios de Cultura Maya 20: 93–116.